And the brilliance of the adventure lies in simply making fun of all the costumed characters that movie-goers now see every couple of months. The Titans want to get into the movie world, especially their leader Robin the Boy Wonder, and they generally wreak havoc upon the makers of these particularly strange films, The story, like the cartoon, is frenetically paced, and features all the main cast in their voice roles, along with Nicolas Cage, Jimmy Kimmel, James Corden, Patton Oswalt, Will Arnett and Kristen Bell taking on characters in this DC comics universe. If you can’t have a good time at this film – especially if you love comics and comic book movies – then I would readjust your joy meter. 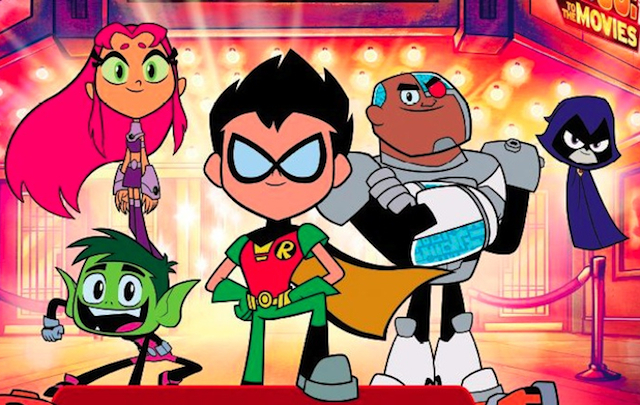 The film begins with the Teen Titans… Robin (voice by Scott Menville), Starfire (Hynden Walch), Cyborg (Khary Payton), Raven (Tara Strong) and Beast Boy (Greg Cripes)… fighting Balloon Man (James Corden), who don’t know who they are. While doing a “sick beat” rap song introducing themselves, the Justice League intervenes – including Superman (Nicolas Cage) and Batman (Jimmy Kimmel) – and berates the crew for not being serious enough to get their own movie. This starts them on their journey to Hollywood and Warner Bros., where they encounter Jade Wilson (Kristen Bell), the director of many of the superhero epics. Trying to stall their efforts is Slade (Will Arnett), who the Titans hope will become their nemesis in the pitch to get their movie. In stealing a rare gem, Slade unwittingly becomes part of the launch of a newly invented movie streaming service called DOOMSDAY (badly named), and the Robin movie will be the first film to infiltrate every device. Action!